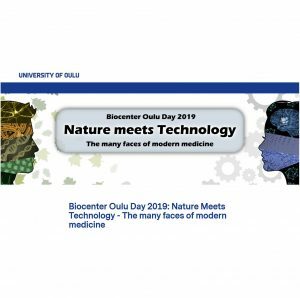 Biocenter Oulu Day 2019: Nature Meets Technology – The many faces of modern medicine. Cheos is participating the vendor exhibition on Tuesday the 9th of April, 2019. The theme of the day will be ‘’Nature meets Technology: The many faces of modern medicine’’. There will be interesting talks by experts from different fields, which includes Nanotechnology, Artificial Intelligence, Natural products and Ethics. Come to find out how these fields are changing the future of medicine such as in cancer and drug delivery system. In addition, how the machine learning and natural products are being used for benefit of human health. Welcome to the 29th Biocenter Oulu Day!